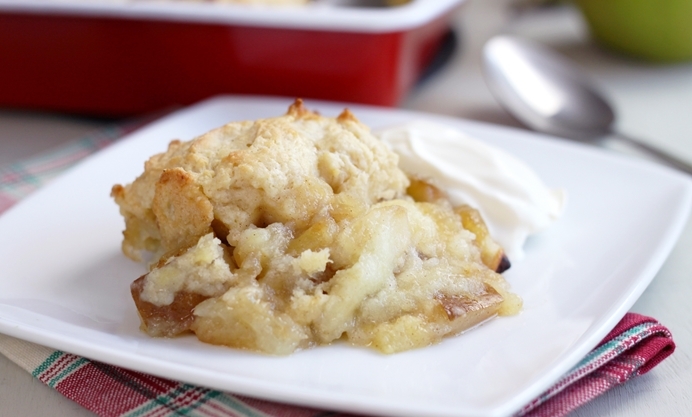 Cosy up with this comforting apple cobbler recipe. A fluffy and light cobbler topping perfectly complements the warm, cinnamon-flecked fruit underneath. When waiting for the bus causes your fingers to freeze, and the sky is black before you even get home in the evenings, it's nice to have a comforting dinner to come back to. I usually try to go for something fairly healthy like a warming bowl of soup or stew, but other times nothing hits the spot like a big bowl of hot dessert. This time I went for apple and pears, topped with a cakey cobbler topping - and a big dollop of cream, of course. 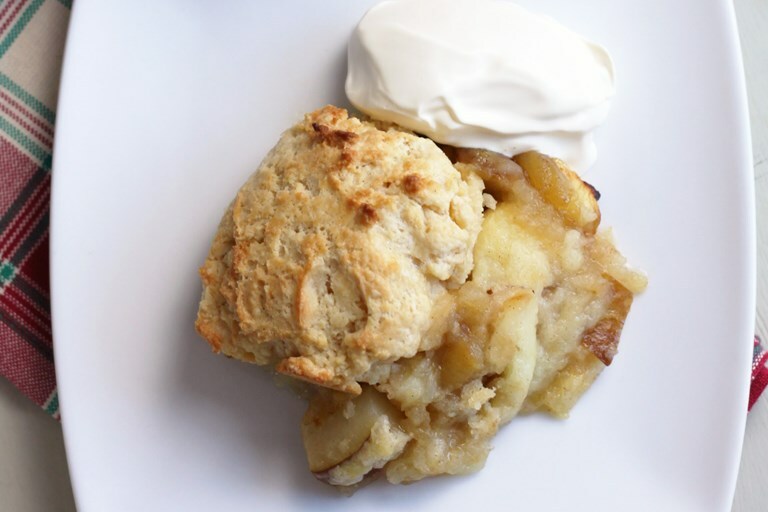 Prior to making this apple and pear cobbler, I usually went for a crumble instead. Crumbles always seemed easier to make - at the very least, you can just throw some oats on top of your fruit, and you'll have something that works. Making a scone-topped cobbler, on the other hand, always seemed to require a bit more skill, to ensure that the topping ends up light and fluffy, and not just rock-like lumps. I read about twenty different cobbler recipes to give myself some guidance. Unfortunately this turned out to be entirely useless, because they all said completely different things. Some used plain flour, others self-raising, some had baking powder. Some used yoghurt, some used eggs, some used milk, some used all three. So in the end, I decided to just make it up as I went along. It worked unbelievably well! The cobbler topping was fluffy and light, but still nice and comforting, and it was a great addition to the warm, cinnamon-flecked fruit underneath. I also really enjoyed the combination of apples and pears, which gave the perfect wintry flavour. The larger chunks keep their shape and give the mixture a bit of bite, while the smaller chunks cook down, almost creating a fruity sauce.